Continuing from last week’s episode, Tian Xing walks into the room confidently as if he belongs there and motions for Tao Zi to pass him the presentation script. He barely takes two glances at it and passes it back to Tao Zi, before starting his presentation. “I will solve the question for everyone. The answer lies here,” and he pokes at his left chest. “Our heartbeats are the only things that can’t lie.” Everyone starts to look impressed and Tian Xing targets the girl next to the higher-up. Happy girl says, “I’m Peggy.” Tian Xing takes out a Samsung phone and uses an app to track her heartbeat. “I would like to ask, do you like me?” Peggy thinks for a while and nods happily. At the same time, the app shows that her heartbeat has reached 106 beats per minute. I think uhm, anyone’s heartbeat is gonna reach over 100 if you keep smiling at them like that. Tian Xing finishes his presentation with, “Samsung has thought about its users in ways that they can’t even think about. Let’s start with a new direction, a new life.” (‘new’ and ‘heart’ sounds the same in Mandarin, hence the pun) The presentation is of course, Tian-Xing-awesomeness, and the higher-ups are really happy with it. He leaves with a cool Adieu, but disappears quite uncool-y into a room to change. It’s quite hilarious how he has learnt to take off his clothes at top speed to put on appropriate clothes. No one’s complaining, as we all catch a glimpse of Aaron’s abs. Xiao Lu catches up with the OZ gang and makes up an excuse for his absence. The rest don’t suspect a thing but Leo seems to consider his reason quite carefully. Lance receives a phone call which informs him that Tian Xing just did a presentation on OZ’s behalf and he looks really pissed. We switch back to a rather cute mental confrontation between Tian Xing and Xiao Lu. 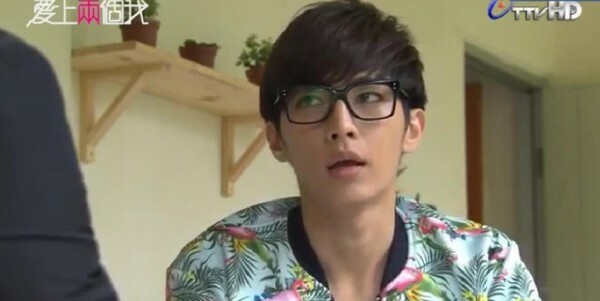 Tian Xing reminds Xiao Lu that the one Tao Zi should like is him and hence, Xiao Lu cannot accept Tao Zi’s confession. Tian Xing replies that helping OZ and liking Tao Zi have become one thing and that he will unlock Tao Zi’s heart. So this guy just sits there, basically arguing with himself. Tao Zi shakes him out of his daydream but seeing Tian Xing in the background, Xiao Lu tells Tao Zi that his friend needs his help in the production of a mini-movie. Tao Zi is sad because she can’t see Xiao Lu anymore but on the surface, she asks if he will come back often to visit them. Xiao Lu promises to do so. Tian Xing sits at his house, dressed in Xiao Lu’s clothes but without the iconic specs. He is frustrated over the issue but Fu Bo informs him that he has arranged things with Samsung as per the Young Mister’s request. So what’s the request? Turns out Tian Xing smartly gets Samsung to request that he must be OZ’s consultant during the production process. He turns up at OZ’s agency, much to everyone’s chagrin, especially when he laughs that the interior design resembles that of a kindergarten. HAHA. What a reply, that leaves Tao Zi speechless. Leo welcomes Tian Xing gracefully but with a warning that every member of OZ is an integral part of the creation process. Tian Xing agrees happily, emphasising that advertising is always about teamwork. That being said, no one is really happy when Tian Xing gives a mark of 59 to the current references and files OZ has come up with. He wants them to do even better than the previous ad and above the expectations of the viewers, or else, everyone is going to think that the previous housing ad was just a fluke. Miao miao is not happy at all. He sets them a deadline of midnight that night to send him the new files and drags Tao Zi off for lunch (but not before calling Jia Gai Xian as Ma (Horse) Gai Xian). During lunch, he keeps staring at her while she eats. That is a bit creepy, Tian Xing. I won’t want a guy to be staring at me while I eat, no matter how good looking you are. Tao Zi feels uncomfortable and calls him out for not actually wanting to discuss anything with her over lunch. Tian Xing says that he’s thinking of how he should make Tao Zi fall in love with him and she gets irritated with the topic. He catches her arm and wants to use the heartbeat test, “You can lie to yourself, but you can’t lie to your heartbeat.” He challenges her to use the app and she takes it on. They stand in silence as Tian Xing stares at her with smouldering eyes. And we see that her eyes soften a bit. Her heartbeat remains at a normal 86 beats per minute. She laughs at his idiocy and leaves the restaurant, leaving behind a slightly dejected Tian Xing. She walks by the shop which sells red bean buns and recalls how Xiao Lu wanted to try it the previous time. She starts queueing for the buns and texts Xiao Lu to come by OZ later to get them. Behind her, Tian Xing looks on with a conflicted expression. Tao Zi’s face lights up, much to Jia Gai Xian’s and Miao Miao’s amusement. However, Xiao Lu responds with a lukewarm smile. He disappears round the corner to help Jia Gai Xian check with some props and Tao Zi follows with a box of red beans. Xiao Lu pretends that he didn’t receive the text and that the reason he’s here now is because he happens to be nearby. And this Xiao Lu, he takes a step backwards. Tao Zi dries up, “filming the movie…” He says, “It’s all right,” and she quickly leaves him alone, sensing that something is not right. It’s quite sad because we know Xiao Lu doesn’t like doing this at all. Hahaha, hiding your face with a deer isn’t going to help. He also insists that Tao Zi sits in the same car as him and left with no choice, the OZ team continues on their way. Tian Xing pokes fun at the old OZ van and says it should be scrapped soon but he gets scolded by Tao Zi. He tells her not to make so much noise or he will kidnap her, and funnily, Tao Zi happily takes the threat and shuts up. The car and van stop at a crossing for the train to pass but somehow, the sirens and the noise of the train send Tian Xing into agony. He starts sweating profusely and he seems to have a headache as he tries to curb his emotions about the noise. Tao Zi notices and worries over him. When the barriers are raised, the OZ van proceeds forward but Leo quickly stops the van when he realises that Tian Xing has turned around. Tian Xing has actually driven themselves to a nice scenic spot at the beach (I’m sure it was supposed to be a romantic coincidence though) and is taking deep breaths by the boardway. Tao Zi rushes up with water which he gushes down. Seeing that he’s in so much discomfort, Tao Zi turns around, wanting to call off today’s project. 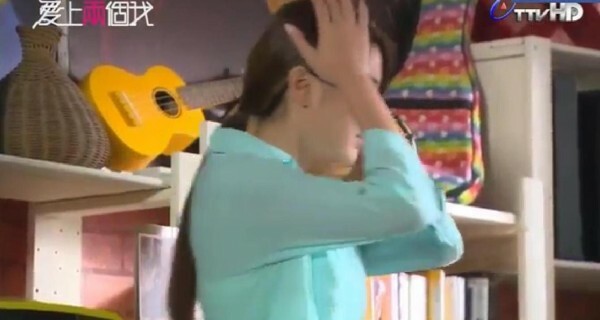 Tian Xing holds her and places his head on her shoulder, “Lend me for a while…a minute will do.” Tao Zi stays still while Tian Xing cries into her shoulder. They finally catch up with OZ. Leo interrogates Tian Xing who answers without batting an eyelid that they turn off to another road because he discovers that there’s nice scenery and that Tao Zi is driving now because she’s showing care and concern towards the consultant. Leo asks Tao Zi if that’s true and she nods. Woots, I guess you have earned yourself some Tao Zi points? The team walks down some scene spot and happily snaps many many photos. Even at that moment, Tao Zi is thinking of Xiao Lu and sends the photos to him, along with a text that she wishes he was here. Tian Xing notices and frowns. During lunch, Tao Zi is unhappy to find spring onions in her dish. Leo and Tian Xing notice the onions and each notices that the other guy has noticed the onions and they poke at the onions together. HAHA. Well, Leo wins the battle and he smiles smugly to Tian Xing as Tao Zi thanks him for unloading the burden of eating onions off her shoulder. Then, somehow we find both guys being in this battle to earn Tao Zi points, such as giving her a hand in climbing the stairs. Tao Zi thanks Tian Xing and Tian Xing smiles innocently at Leo. This battle goes on for quite a while before Miao Miao gets irritated (but Tao Zi doesn’t notice at all). The boys are literally fighting behind her back on who gets to sweep a fallen flower off her head and Miao Miao comes along to swipe the petal off before bringing Tao Zi somewhere else “with no flowers”. Tao Zi buys some red bean buns and Miao Miao teases her for her sudden enthusiasm for red bean buns. In the meantime, Leo warns Tian Xing from harbouring any ill intentions towards Tao Zi and using work as an excuse to get closer to her. Tian Xing dares him and asks him if he has the confidence in winning him for Tao Zi, but Leo replies that he’s not even joining him in the competition. The rest join the guys and the conversation stops there. Tao Zi makes the choice of driving Tian Xing back, showing that her attitude towards him has softened. When they reach OZ, Tian Xing thanks Tao Zi for the one minute, and reminds her that she can lie on his shoulder if she needs it in the future. Tao Zi suddenly gets reminded of the sweet gestures that Xiao Lu has done for her and she turns around without a word, perhaps out of subconscious guilt. 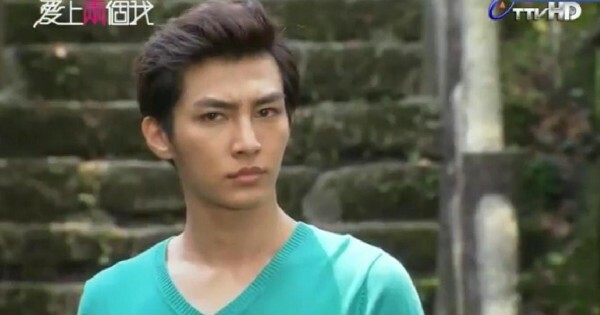 Tian Xing gets a text from her, which basically asks him to pop down to OZ for his red bean buns and he looks troubled. Back in OZ, Tao Zi stares at Xiao Lu’s empty seat while she waits for him to turn up. She eventually hallucinates that Xiao Lu is sitting in his seat and saying hello to her, but she hits her head to wake herself up. She falls asleep but gets awakened by Leo and calls out, “Xiao Lu!” Oops. Leo has thoughtfully brought dinner for her and as they eat, he asks her if she really likes Xiao Lu. The answer is yes. She feels very secure with him and that he feels like a familiar friend who has finally returned to her side. “The other person wants to protect me, but I feel like protecting him too…is this feeling of like?” She asks Leo. He smiles and asks her if she’s feeling blissful. If she is, then yes. It’s the day of the shooting and Jia Gai Xian is being pervy on high school girls as usual. Xiao Lu turns up for the shoot, claiming that it’s break time at the movie shooting. He helps Tao Zi carries some heavy loads yet Tao Zi can’t help but feel that there’s an inexplicable barrier between the two of them. Whilst OZ is busy, Xiao Lu sneakily sends a text to OZ, informing them that he will be visiting the scene in half an hour. He then tells them that his break time is over, so he has to go back to help his friend. Even though Tao Zi is obviously disappointed, she graciously tells him to hurry back. The moment Xiao Lu disappears out of OZ’s sight, he starts to rip off his shirt even before he gets into the car. HAHA, I’m not sure that’s how you do it, Xiao Lu. and freezes when a middle-aged lady peers through the window. Turns out he has left his shirt on the walk way and the lady is trying to return it to him, albeit in a really pervy manner. 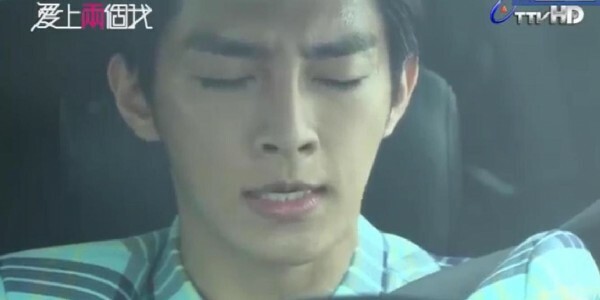 He finally gets into his Lu Tian Xing mode and steps out of his car, only to run into the team from Tian Ji. Lance tells him that he was quite angry about Tian Xing helping OZ out but he figures that it will be good for any future collaborations. Tian Xing has no choice but to go with them to the shooting scene. Resulting in this sorta face off. 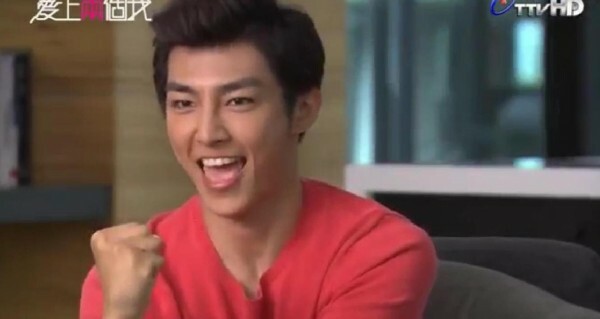 I like the way they place the face-off — Tian Xing smirks at Tao Zi, Leo and Lance exchange glances, and Jia Gai Xian steps on a podium to compliment how hot the other girl always appears. They finally get down to business, and Jia Gai Xian turns around to cue for his equipment. While still on his podium HAHA. Halfway through the shoot, Tian Xing yells cut, much to Leo’s annoyance. Tian Xing talks to Leo at a side and you can see that Leo ultimately agrees with what Tian Xing suggests. The other people are observing the duo closely during this interaction, especially Lance. Eventually, the shoot goes really well because of Tian Xing’s suggestions and Tian Xing even compliments Leo for his great directing. Honestly, the ad didn’t look that great to me, but it might not be the final cut. Tao Zi smiles at Tian Xing, thinking to herself that this is how it feels when a team works on a project together till it finishes. Tian Xing notices her glances and looks back, upon which she promptly turns her smiles towards Leo. Lance notices this silently. After this is over, Tao Zi waits by Xiao Lu’s residence, despite her calls not getting through to his phone. Tian Xing sees this but decides to change into Xiao Lu to wake her up. Argh, you can see that both Xiao Lu and Tian Xing don’t like doing this to Tao Zi, but he kinda has no choice. Xiao Lu quickly says that he’s just worried he might not be able to join OZ whenever his friends need help, and quickly goes into the kitchen to get cutlery for the dessert she bought. In actual fact, he looks at her and lowers his head in frustration, just as she does. I like this scene, them in their synchronized melancholy. The next day, Tao Zi appears really distracted as Xiao Lu’s words ring in her head. Leo notices but says nothing of it, instead just passing her the first cut of the ad via a CD. Tian Xing calls her and asks her to send the CD over. We have a mini comic relief here where Tao Zi protests, “Why can’t you come to our company to get it? How would I know where your house is? ?” but the next scene shows her at the door with a really smug Tian Xing. He still eats the noodles with great satisfaction and reminds Tao Zi that she can’t get her watch back until she pays him back in full. He joins her at the kitchen and points out that OZ’s triumph card is Leo, but she looks like a manual worker. In order to stabilise OZ’s foundation, there are two tips. “The first tip, you must have an aura. Even if you are lying, the listener should believe your judgement and opinions entirely.” But looking at Tao Zi’s inability to keep her emotions hidden, they will have to resort to the second tip. “So what’s the second tip?” “The second tip…” He leans in and tips her chin up secretly. I like this episode’s development, even though we kind of got cheated at Episode 7’s preview which events will only happen in Episode 8. No matter how cliche the methods are, I do like that Tao Zi is starting to soften with Tian Xing, but that she is faithful towards Xiao Lu. It might be hard to shift her completely towards liking Tian Xing but I think getting Tian Xing into her good books should be a good and laborious start. I think the scene between Xiao Lu and Tian Xing is adorable but makes their characters diverge too much. After all, we aren’t going to get Aaron into a bipolar role. I still believe that Xiao Lu is part of how Tian Xing is, and I would love to see more scenes of mix and match personalities. For example, Xiao Lu exhibiting Tian Xing’s traits and vice versa. In a way, I also see Xiao Lu as a manifestation of Tian Xing’s emotions. Maybe I’m interpreting too much, but I think Tian Xing does struggle to keep Xiao Lu away from Tao Zi. Perhaps he even subconsciously contemplates the possibility of Xiao Lu being together with Tao Zi, even though we all know that will be a disastrous choice. The product placement is a tad too much in this episode, not that I’m complaining. But to tie things up, they better show some scenery as a backdrop for the Samsung’s ad, or OZ’s trip to Mother Nature would have been merely a platform to showcase the boys’ battle. Still loving the occasional comic relief in this episode, such as Tian Xing/Xiao Lu’s ability to rip off clothes at a fast speed. I’m also excited to know the story behind Tian Xing’s panic-ish attack at the train tracks. Did his parents die because of a train accident?